For most visitors to New Zealand, their first port of call will be the city of Auckland. Many travellers never actually leave the airport, and instead choose to head straight onto a domestic flight to the South Island or other places in the north. As a destination, Auckland doesn’t usually get much a write-up on blogs or travel sites. As New Zealand’s largest city and main business centre, it doesn’t often strike tourists as a place that’s worth visiting. It might not have the mountain vistas of Queenstown or the steamy hot pools of Rotorua, but Auckland still as much to offer. We highly recommend staying overnight on nearby Waiheke Island, Auckland’s stellar lifestyle destination and a wine lover’s paradise! 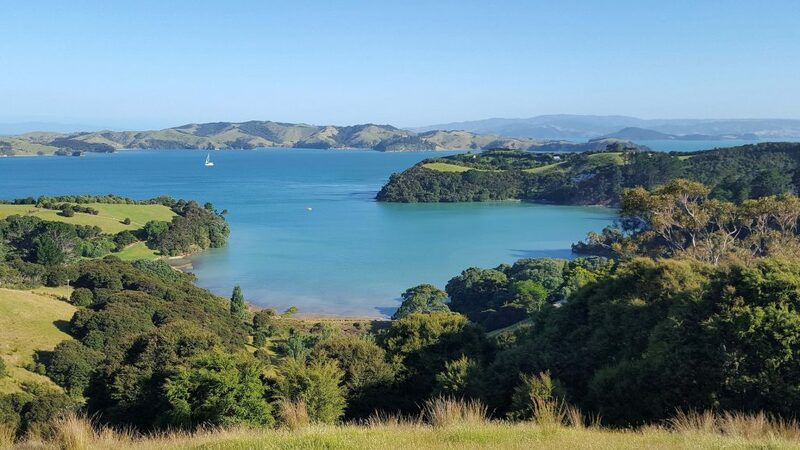 Waiheke Island is only a 40-minute ferry ride from Auckland’s downtown terminal, and it’s a world away from the hustle and bustle of the city. It’s located northwest in the Hauraki Gulf, the body of water adjacent to the Auckland region. Despite being just 92 square kilometres in size, Waiheke is home to over 20 world-class vineyards due to its temperate, dry climate. 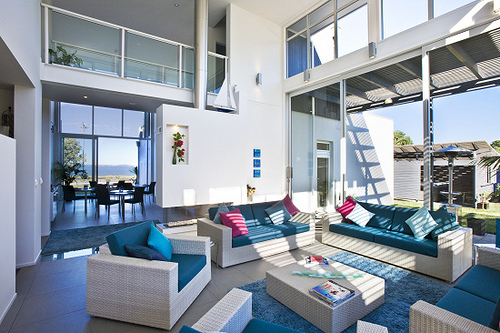 Waiheke Island also contains stunning white-sand beaches, upscale eateries, and luxury accommodation. In short, it’s the quintessential holiday destination, and the perfect way to introduce yourself to what New Zealand has to offer! 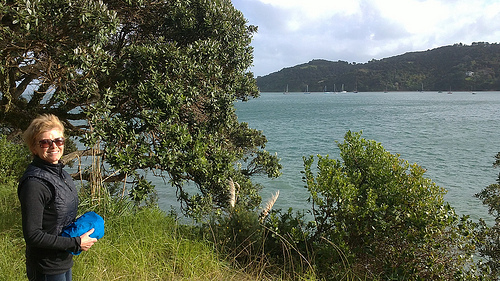 Like the rest of Auckland, Waiheke Island has a subtropical climate. It also has a unique microclimate, which gives it around 100 more hours of sunshine than the rest of the region. This makes it a great destination to visit at any time of the year, though the summer months of December – March tend to be the driest and warmest months, whilst June to September (the winter) are the wettest. 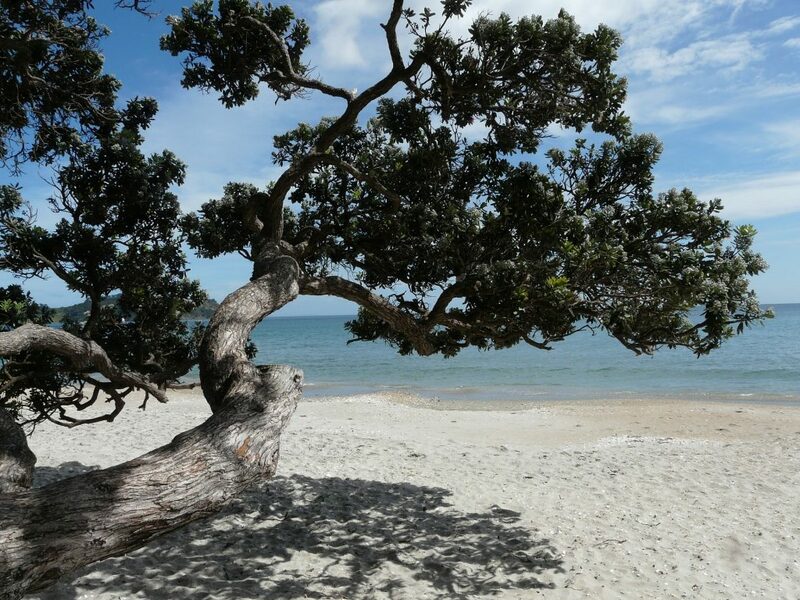 The summer is peak season for tourism, with local Aucklanders also spending time on the island during the school holidays. 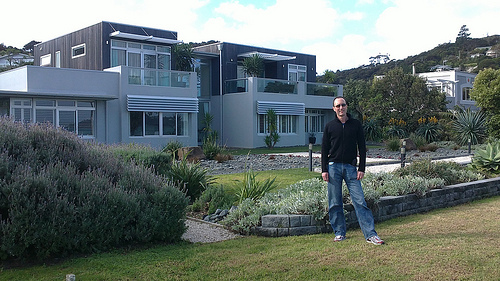 This means that Waiheke will be a lot busier, and accommodation likely to be more expensive. For more information on the best time to visit New Zealand, you can check out our dedicated seasonal guide. On our trip to Waiheke Island, we are met at the wharf by Breakfast on the Beach Lodge owner, Keith, where we are staying tonight. It’s so nice not having to muck around with taxis or rental cars! It’s a beautiful winter’s day on Waiheke Island, so Keith drops us off at Oneroa village to have a look around, while he drops off our bags at the lodge. We try something different for lunch and eat at ‘Delight’, a lovely Turkish cafe. The waitress is a sweetie, and recommends a delicious piece of carrot cake to finish. The food is tasty and the coffee is DIVINE! What a wonderful evening! First, we joined our hosts for drinks and nibbles (although I concede that Waiheke wines with salmon blinis probably demand a better description!) Breakfast on the Beach Lodge is an architectural statement and co-owner, Marilyn, has dressed the interiors in pristine white and sea blues. The interiors are particularly gorgeous at night, lighting up all the colours of a Paua shell. We’re dining at a very special place tonight. Thymes Table is a very unique restaurant on Waiheke Island. The choice is deliberately limited, with just one entree, one main and three desserts to choose from. I’m out of my comfort zone and entree is squid..never eaten THAT before! Those squid morsels wrapped in spicy pastry and deep-fried are great. The main course is pork (another challenge for me). All the flavours work, and the Spanish wine suggested for the main course was perfect. The interior decor is painted in Fishtail green. (Yes, that’s what it said on the paint pot, according to the Sanne our maître d’!). 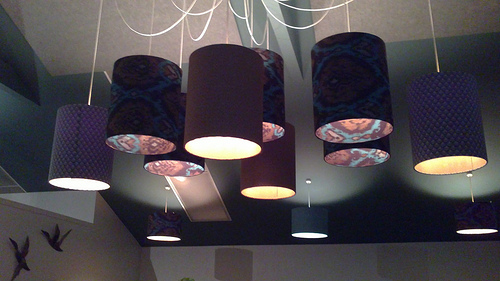 Don’t you just love those cylindrical lampshades hanging from the ceiling? We’re back at the lodge. 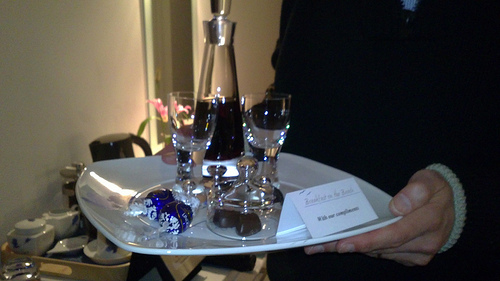 The bed has been turned down, and there’s a beautiful decanter of port waiting for us with chocolates to accompany. WILL THIS HELL NEVER END!! Note: Ferries to Waiheke Island leave every half hour from Auckland’s downtown ferry terminal on Quay Street. As the commuter rush on weekdays makes the ferries very busy, we’d recommend waiting until 9 am to catch your ferry. The last ferry back to the city from Waiheke Island leaves at 12:30 am. You can find more information on fares and travel times on Fullers Ferries website. In Part Two of this trip, we will be checking out Waiheke Island’s top vineyards! You can read our recommendations here.